BOLLE have already conquered the market in Extreme Sporting Head Gear and Sunglasses and undoubtedly you will have seen their Goggles or Eyewear on skiers, snowboarders and even cyclists. With this successful brand image and slick line of manufacturing, they’ve recently introduced a new collection of Safety products to protect eyes in a new wave of tougher conditions. Their popular designs translate well into the PPE side of the business. Whilst safety is key, they can offer both a fashionable look and comfortable solution without compromising on the highest level of protection and safety standards. Ever-evolving, their main objective is to detect all the risks in the work place and provide tangible and technical solutions in strict compliance with European Standards. Hustler, Rush & Galaxy, to name a few, are popular frames in the range, promoting style and functionality. Additional features across the collection include: polarized lenses, high impact ratings and even LED lights, to meet the unique demands of each work environment. 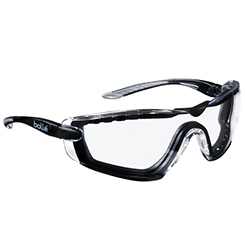 Find the right pair of safety glasses for your job here. Shop BOLLE today at My Tool Shed.